Tilapia is growing in popularity and is becoming a more common dish found in restaurants around the world. Tilapia has many health benefits in addition to its tasty, light flavor. It doesn't have the "fishy" taste that some other fish fillets, such as bass, have. Its a lean fish that is low in fat, sodium, carbs, and calories. This recipe is designed to enhance this delicious fish by combining ingredients that are subtle, yet bring out the natural flavors in the fish. Light your gas grill to medium high heat or light your charcoal grill. Mix all of your ingredients except for the tilapia in a medium size mixing bowl. 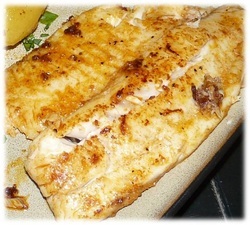 Spoon a small drop of the seasoning mix on each fillet and spread evenly to fully coat the fish. Flip each fillet and repeat to coat both sides. Put your fillets on the grill and flip them once after 4-5 minutes. Try to avoid moving the fillets around as they will become flaky and may break apart. After you flip the fillets after 4-5 minutes, cook the other side for 4 minutes and your grilled fillets can be taken off the grill.